Shonna Anthony, Kentucky Rx Card Representative, presented a check to Kentucky Children’s Hospital. Ms. Lori Donaldson, Corporate and Community Relations Manager, was pleased to receive the check donation in the amount of $4,433.50. As Shonna’s son was a patient at this hospital, it was particularly special for her to tour the hospital and see how Kentucky Children’s Hospital is able to leverage the donations to help fund life-saving equipment, charity care, research and more. 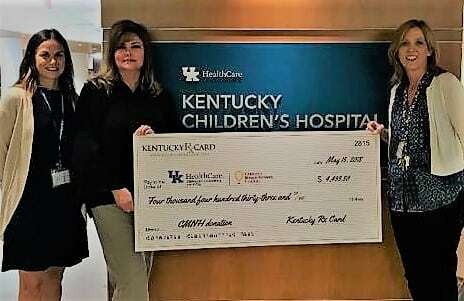 Kentucky Rx Card is committed to helping Kentucky Children’s Hospital raise funds that will help provide care for those children in need of medical attention. A donation will be made to your local CMN hospital each time a prescription is processed using the Kentucky Rx Card. Since 2015, the United Networks of America partnership with Children’s Miracle Network Hospitals has raised over $2.4 million dollars for local children’s hospitals. Of this, $4,433.50 has been raised for Kentucky Children’s Hospital. Kentucky Children’s Hospital serves as the subspecialty regional referral and pediatric care center for Central and Eastern Kentucky. There are more than 70 pediatric specialists and more than 300 pediatric nurses working in 24 areas, as well as physical, occupational, speech and respiratory therapists, dietitians, licensed clinical social workers, genetic counselor, child life specialists and pharmacists, all of whom are dedicated to caring for children.